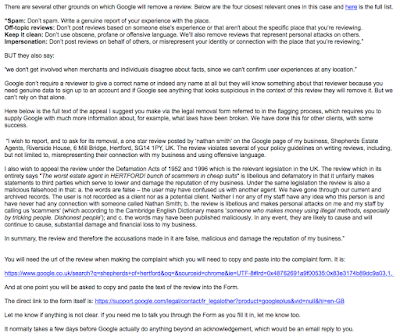 HelpHound Blog: Negative reviews - is there any remedy? Businesses with established reviews presences - hundreds of reviews on Google and other sites - Yelp, TripAdvisor, Trustpilot etc. Yes - we know that Noble Caledonia have 26 reviews - now. But six months ago they had none. Bear with us (see below). Just a few months ago the Ritz had a hard-won score of 4.6 on Google - showing in every search. Then they threatened to sue the Ritz Ballroom in Brighouse and some of the Yorkshire locals took to Google to express their discontent - by writing one-star reviews. The Ritz is possibly one of the very few hotels in London that has built a reputation strong enough to cope with a drop in their score to 4.2; most other hotels, finding themselves in anything like that position would have been forced to cut rate to maintain occupancy. That's how sensitive to review scores the market is. Last year the Nearwater bed and breakfast in St Mawes received a single one-star review - driving its Google score down from a near-perfect 4.9 to a marginally less impressive 4.7. But worse was to come - because they had few reviews in total that one star stood out like a sore thumb, and bookings dried right up. The review had been written by someone who had never stayed, but had seen the Nearwater featured on Channel 4s 'Four in a Bed'. The owner tried everything - contacting Google in the UK and in India - before HelpHound saw the article in the newspapers and volunteered our services. The full story - and its happy ending - is here. No reviews at all a year ago, a single negative complaining about a wrong phone number eight months ago - and then one of their cruise ships hits a reef in Indonesia. Result? Twenty four one star reviews. - and a very off-putting score on Google. An example of a business that had not engaged with reviews and will now be rapidly evaluating what is the best proactive policy to pursue. 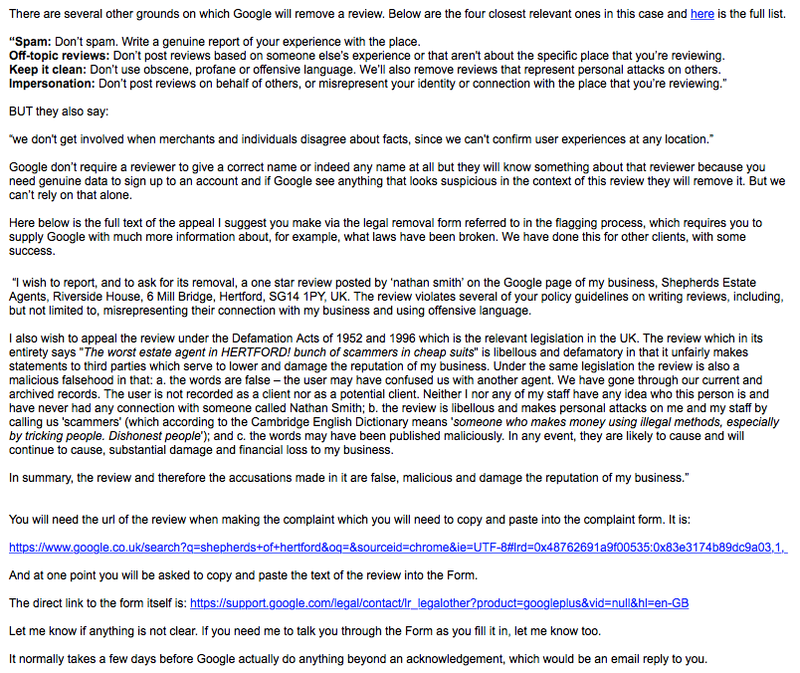 All three of these businesses are - in a sense - lucky, they have so obviously been the victim of a category of review that Google generally find it pretty easy to delete. If they are approached in the correct manner (more on that later). Any criticism of a business is, under UK law, prima facie, libellous. That means that any business could, in theory, challenge any negative review, its author (the reviewer) and its publisher (the website). But would it? 'Business bullies customer' is never a great headline, so any business is going to think long and hard before resorting to legal action, and will rightly examine all the alternatives. And sites like Google are going to stand foursquare behind negative reviews - and their reviewers - that they believe to be written with sincere motives. Google don't make it easy (you would not expect them to). But if the review that is harming your business has been written with impure motives or with pure motive but in ignorance of pertinent facts - or, importantly, is in contravention of Google's review policies - a properly constructed appeal to Google does have a good chance of success. We have been constructing appeals for our clients for nearly four years now. From today we will be offering this appeals service to every business, whether it be a HelpHound client on not. We will not advise you to tilt at windmills; we will assess every case on its own merits and advise you before any agreement is made. After that we will draft your appeal and forward it to you will detailed step-by-step instructions on how to submit it. Our standard fee for clients is £150 per appeal. For non-clients our standard Terms of Engagement will apply.